Fasten your seat belts and secure all belongings — you’re in for a wild ride! 7C is an Italian trio consisting of Davide di Virgilio on acoustic and electronic percussion, Giuseppe Iubatti on upright bass, and Tony Berardinucci on guitar and electronics. 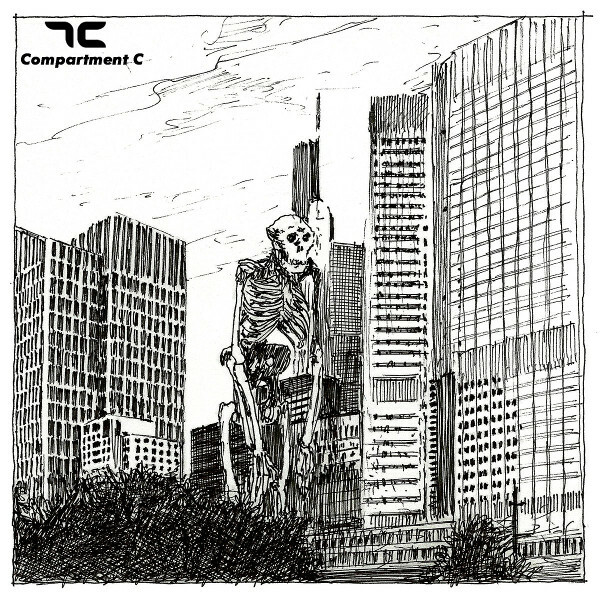 Previous incarnations of the band have featured other instruments, and the inclusion of guitar is new to Compartment C, which is their third release. After a brief introductory track of electronic sounds, they dive into “Approaching a City,” which features phrenetic drums punctuated by bursts of hugely distorted guitar and seemingly aimless notes from the bass. At later points, the track drifts into free-form sections full of insane effects from the guitar. Each of the other tracks features similar features, with differing balance and variations on what types of acrobatic craziness the guitar indulges in. “Eleven A.M.” is probably my favorite track (check out the video), with its electronic percussion, bursts of weird tones, and unpredictable structure. In general, Iubatti is the anchor, providing solid, relatively simple lines (both plucked and bowed) in the midst of the explorations on guitar and drums. At 38 minutes, Compartment C provides a too-brief taste of a band that is a worthy addition to the stream of musicians expanding jazz into the areas of electronics and noise. I think it’s fair to speculate that listeners who enjoy what Raoul Björkenheim has been doing will dig this too.